Leicester City winger, Ahmed Musa, has stepped down as assistant captain of the Super Eagles team. Musa informed coach Gernot Rohr of his decision, just before the kick off of their friendly match against Senegal, at The Hive Stadium in London. This development was confirmed by BBC reporter, Oluwashina Okeleji via his Twitter account. 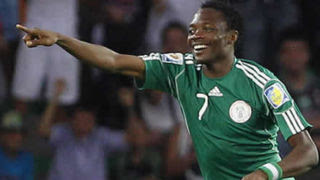 Musa was appointed as assistant captain to John Obi Mikel exactly one year ago. The 24-year-old who had replaced Vincent Enyeama as skipper until then, handed over to Mikel Obi. “I want to announce now that from today, John Obi Mikel is our new captain,” Musa said at the Eagles’ press conference, ahead of Friday’s AFCON 2017 qualifier against Egypt in March 2016. He started the friendly against Senegal alongside Kelechi Iheanacho and Simon Moses in attack.